CSDT IT Solution's Training is Specialized in Software Development, Website Design or Development, Domain and Industrial Training. We are specialized in providing IT training to the students of several domains like B.Tech., BCA, MCA, B.Sc.IT, M.Sc.IT and so on. CSDT IT Solution is famous for providing the practical based training which enhances the technical strength of the students. CSDT IT Solution aims to help you in growing your IT career by utilizing our talent and experience. Our mission is to provide cost effective training on latest technology to ensure our students receive the very best return on their investment. CSDT IT Solution has proved its expertise in the field of website designing training, Web Application Development Training, Mobile Application Development Training, SEO Training & Software development training for more than 7+ years now and today it has successfully established itself as one of the best and most reliable Website Designing training, Graphics designing training and Software developments training on .NET / JAVA / PHP based. Our training Students are 100% placed in IT Company. We provide technology based Practical Training, Interview Preparation. CSDT IT SOLUTION has its own training and placement cell. This cell is totally dedicated towards providing jobs and making our trainees employed. 1. Placement cell of CSDT interacts with all HR and Technical Talent Acquisitions department of higher level MNC's to mid-level MNC's and all startup companies/firms as well. They gather all requirements about job profiles available there and provide them to CSDT training division. 2. Now experienced professionals of training division makes a syllabus paying their best attention towards job profile requirements. 3. In 3rd step students / trainees got trained in that particular specialized skill according to company's need. 4. 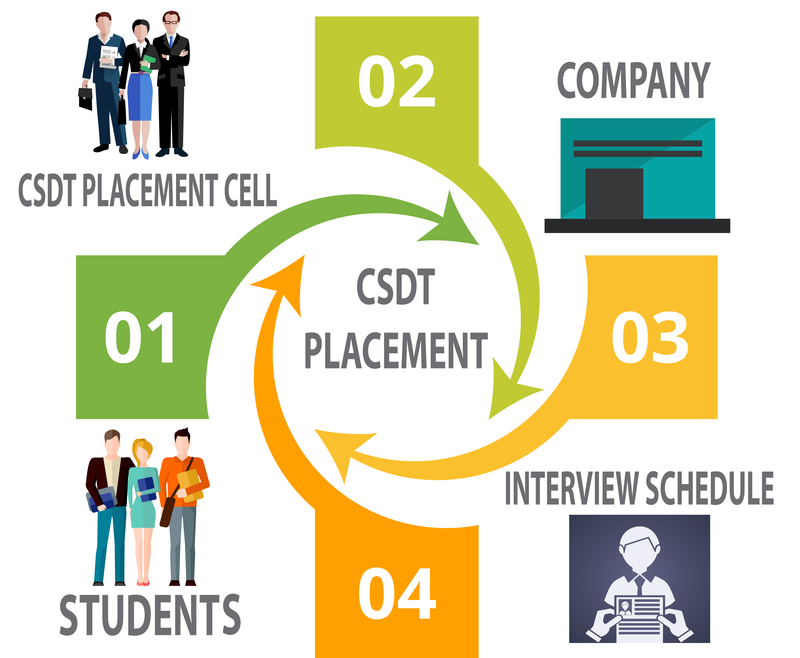 After training them, CSDT PLACEMENT CELL schedules an interview session or schedule a placement drive especially for that candidate who has been trained by CSDT according to the match between the requirements of job profile and the skills or technology in which trainees got trained at CSDT. With this simple and easy process trainees get their first IT sector job easily.